Hyperion’s Record of the Month for January takes multi-award-winning Baroque legend Angela Hewitt to the elegantly refined French court of the early eighteenth century. Jean-Philippe Rameau topped the summit of the Musical Establishment—named Compositeur du Cabinet du Roi in 1745—yet his pedigree was hardly auspicious. For a time a travelling violinist, he held numerous undistinguished posts as provincial organist (rarely serving out his contract and on one occasion deliberately playing sufficiently badly to ensure his dismissal) before finally settling in Paris at the age of forty. Something of a theorist—his treatise On the Technique of the Fingers on the Harpsichord makes for essential reading—Rameau’s intellectualism combines in his music to produce passion and tenderness, in his own words ‘true music … the language of the heart’. Some sixty keyboard works are known, gathered by key into five suites; Hewitt here performs three of them. Courtly dances (including the famous Tambourin) sit alongside more programmatic movements (such as Les sauvages—Rameau had just seen two Louisiana Indians performing at the theatre) in these engaging and deceptively catchy miniatures. Admirers of Angela Hewitt’s acclaimed Bach and Couperin recordings will need no encouragement to sample these new delights. Angela Hewitt was named Artist of the Year at the Gramophone Awards 2006, capping a year of unparalleled success and recognition. Jean-Philippe Rameau was born in Dijon in 1683, the son of a local organist and a notary’s daughter. He was the seventh of eleven children of whom only four survived infancy. Unlike Johann Sebastian Bach, born two years later, and François Couperin (born in 1668), he didn’t come from a long line of musicians, his father being the first in his family to follow that profession. Rameau père taught his children music before they could read or write, which was perhaps why the young Jean-Philippe was always singing and writing music rather than pursuing his other subjects at the Jesuit college where he studied. He left there without completing the course, and never having learned to speak or write in an elegant manner. Only when a young lady with whom he had fallen in love at the age of seventeen reproached him for his clumsy speech did he decide to brush up on his French grammar. Later in life Rameau said his love for opera began when he was twelve, no doubt initiated by school productions in which he had taken part. When he was eighteen he went off to Italy but only stayed a short time and never got further than Milan. Michel-Paul-Guy de Chabanon (1729/30–1792), who published some memories of meetings with the composer, tells us that later in life Rameau regretted not having stayed longer as it would have ‘refined his taste’. When he returned to France, it is thought he spent some time as a violinist touring with a theatrical troupe in Provence and Languedoc. Documentation of the first half of Rameau’s life is very sketchy and has not made it easy for biographers. For the next twenty years he went from one provincial church in France to another (Avignon, Clermont, Dijon, Lyons), never holding posts for very long, and usually leaving before his contract expired. While at Clermont for the second time in 1715 he signed a contract to stay for twenty-nine years, but managed only eight. The story goes that the authorities would not let him go, so during the octave of Corpus Christi he purposely played nothing but discords and chose the worst combinations of stops, so that they were finally happy to get rid of him. At the age of forty Rameau went to Paris, where he stayed for the rest of his life (he had worked there briefly during his itinerant years). Two years later he married nineteen-year-old Marie-Louise Mangot, a singer and harpsichordist who later sang in some court performances of his operas. They had four children. Secretive by nature, it seems he disclosed very little of his previous life even to her. Rameau’s compositions until then had included mostly cantatas and motets, as well as a first book of harpsichord pieces (1706). In 1722 he wrote his 450-page Traité de l’harmonie reduite à ses principes naturels which brought him immediate recognition when it was published the following year. It is strange that he left no compositions for organ, as that instrument earned him a living for thirty-five years (he was organist in Paris at Sainte-Croix de la Bretonnerie in the Marais from 1732 until 1738). His fame, of course, came later as an operatic composer, although it was to be another ten years before he wrote his first theatrical masterpiece (Hippolyte et Aricie). Named Compositeur du Cabinet du Roi in 1745 he composed some twenty operas and ballets between the ages of fifty and seventy, and went on until his death just before his eighty-first birthday. His theoretical and critical writings were prolific. Rameau may have been a late-starter, but he made up for it sumptuously. His physique was striking: very tall, and incredibly thin, ‘resembling more a ghost than a man’ (Chabanon). The playwright Piron described him as ‘a long organ pipe with the blower away’. His large and sharp features combined with fiery eyes that reflected his personality, already remarked upon by Père Gauthier at the Jesuit college, who described him as a child of uncommon liveliness. He was accused of avarice, and at his death had a sack full of louis d’or yet only one pair of shoes, but in fact he was very generous to members of his family and helped many young musicians. In Rameau intellectualism combined with passion and tenderness to produce what he himself called ‘true music … the language of the heart’. This liveliness of spirit manifests itself in great abundance in his Pièces de clavecin. In total he left some sixty-odd pieces: after the first collection of 1706, came a second book published in 1724 (revised 1731), and a third circa 1729–30. In addition there are six separate pieces, five of which are solo keyboard arrangements of works from his Pièces de clavecin en concerts. For this recording, I have chosen three of the five suites included in those collections. Rameau himself didn’t give them the title ‘Suite’; he simply grouped together pieces in the same key (major and minor) as was the custom. The first modern edition of Rameau’s keyboard works was published in France in 1895, edited by Camille Saint-Saëns. This edition is now available re-printed by Dover. One must be aware, however, that at this time the harpsichord was hardly if at all in use as a solo instrument, and most of the ornaments were thought impossible and inappropriate on the modern piano. So they were simply left out. The Bärenreiter edition fortunately restores the original text. It also includes the introductions that Rameau wrote to his second and third collections which are invaluable. His essay On the Technique of the Fingers on the Harpsichord should be read by everyone attempting to play a keyboard instrument (no unnecessary movements please!). The table of ornaments is also fundamental to the proper execution of these pieces. The Suite in E minor (1724, revised 1731) is a wonderful piece from beginning to end, and it is surprising that it is not heard more often in its entirety. It includes the well-known Tambourin which is probably Rameau’s most famous tune. It opens with an Allemande that has a lovely swing without losing the nobility of the dance. This nobility is carried over into the Courante, a true example of the French type combining a stately elegance with rhythmic sophistication and precision. Then we have a series of movements that are among Rameau’s most immediately attractive, beginning with two Gigues en rondeau. The original dance came from Scotland or Ireland where it could have originated with sailors (a trace of this can be heard in the second one), but Rameau’s are a mixture of both the Italian type (equal notes, slurred) and the French (the rondeau form and the profusion of ornaments). The next piece, the stunning Le rappel des oiseaux, is the first of the ‘genre’ pieces in his suites. Its war-like calls rouse the birds to action, becoming more insistent as the piece progresses. Then we return to the dance with two Rigaudons, the second in the major (with a double, or variation) especially emphasizing its lively and springy character. It was a dance, done in a circle, which was often included in his operas. The Musette en rondeau is a tender, pastoral scene which Rameau recycled in his opera-ballet Les fêtes d’Hébé (1739). The insistent drone of a bagpipe and the trilling of birds accompany the feeling of contentment during the grape harvest. In the orchestral version, the ‘inégalité’ (unevenness) of the quavers (eighth notes) is written out, attesting to the practise of jeu inégal, without which French Baroque music simply sounds wrong. As in Les fêtes d’Hébé, the Musette is followed by a Tambourin—a theatrical dance which became one of the most popular of the reign of Louis XV, and in which the dancer would have had a tambourine in hand. Rather curiously, but very effectively, Rameau decides not to end the suite there, but adds La villageoise, a poignant, innocent rondeau whose theme he ends up embellishing as an extension of the second couplet. 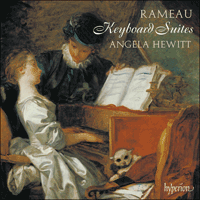 The remaining two suites on this disc make up the entirety of Rameau’s Nouvelles suites de pièces de clavecin which appeared sometime around 1729–30. In them we find an increasing richness, passion and sense of drama, as well as some new technical effects on the keyboard. It is interesting to note that at the time of their appearance, Couperin had written three of his four books of harpsichord pieces, Bach was in the midst of publishing his six partitas (one a year beginning in 1726), Handel had written his first set of keyboard suites, but Scarlatti had not yet begun writing his sonatas. The first few pieces in the Suite in G minor are innocent enough. Les tricotets was a popular dance in the sixteenth and seventeenth centuries and a favourite of Henri IV. Presumably the quick movements of the feet, involving both heels and toes, were meant to resemble the nimbleness of knitters (‘tricoter’ means ‘to knit’). The alternation of two and three beats to the bar immediately reminds us of the minuet in Bach’s Fifth Partita—also in G major. L’indifferente (‘The casual lover’) is a minuet, and was a popular title for a character piece (as well as the title of a painting by Watteau, painted some eleven years before this piece was composed). Of the two graceful Menuets that follow, one in the major, one in the minor, the first reappears nine years later in his lyric tragedy Castor et Pollux. Then comes one of Rameau’s masterpieces, La poule, with the obsessive clucking of the hen (Rameau writes ‘co co co co co coco dai’ under the opening notes). It is pure drama, and, as Cuthbert Girdlestone wrote in his 1957 biography of the composer, ‘has the intensity and singlemindedness of a Racine tragedy, with alternations of hope and despair’. Rameau marks these contrasts with the words fort et doux. It is possible that the first sketches for this piece go back to his early days in Paris when the Jesuit Père Castel discussed with him the bird songs noted in the writings of Athanasius Kircher (1650) and aroused his feelings for depicting nature. The five repeated notes of the theme become hammered-out chords in the right hand towards the end, with the arpeggios transferred to the bass. Observing all of Rameau’s ornamentation requires some quick fingerwork. The next movement of the suite, Les triolets, calms us down with its poetic melancholy and tenderness. Rameau states in his preface to this collection that it should not be taken fast. It ends with a ‘petite reprise’—a written-out echo of the last few bars. A triolet was a medieval verse form that became popular again in the seventeenth century. On 10 September 1725 Rameau attended a performance by two Louisiana Indians at one of the theatres of the Fair. Their dancing must have made an impression on him, because he characterized them in the next piece, Les sauvages. As a Canadian I can’t help imagining the colourful displays of our Canadian native people, especially when playing the descending repeated notes of the theme. It became one of Rameau’s most popular works, and he later included it in his opera-ballet Les Indes galantes. The mood is one of a lament, with poignant chromaticisms and a few contrasting bars where, to alternate with gracieusement (‘gracefully’) Rameau writes hardiment, sans altérer la mesure (‘boldly, without altering the tempo’). The final movement, L’egiptienne, is inspired by the dance of a gypsy girl, and brings the suite to a brilliant conclusion. In his preface Rameau sensibly warns us not to take the fast pieces too fast, but rather to be more intent upon capturing their correct character. That seems especially apt in the case of this piece. For the Suite in A minor, Rameau uses the traditional opening dances of Allemande, Courante and Sarabande, but there is nothing standard about his treatment of them. Right from the start, he sets a tone of noble grandeur, only briefly relieved at the end of each section of the Allemande where a toccata-like figure is introduced for a few bars. The writing is much more contrapuntal than in the earlier E minor Suite, the interpretation far more challenging. I think Girdlestone is right to devote so much attention to the Courante, which he calls ‘one of the summits of Rameau’s art’. It is one of his most difficult pieces to comprehend and to play, not just because of its rich counterpoint and rhythmic complexities (the jeu inégal must be used judiciously and with freedom but within a strict frame), but because the execution of the ornaments also requires tremendous skill. Even after you have figured all that out, you still have to make music. As Girdlestone says: ‘The door has to be knocked on more than once before it will open, but of the riches within there is no doubt and the effort is worthwhile.’ The solemn Sarabande is also richly ornamented, with swirling, written-out arpeggios that heighten the tension. It was reused more than twenty years later in his lyric tragedy Zoroastre. In the next piece, Les trois mains, Rameau gives the illusion of there being three hands by having the left one constantly cross over the right, providing at the beginning a criss-cross accompaniment to the tender melody; the music becomes more sprightly later on, foreshadowing Scarlatti. Next come two contrasting character pieces: the first, Fanfarinette (a female nickname), must depict someone of great charm—carefree and flirtatious. The second, La triomphante, is exactly that. The final Gavotte with its six variations closes this suite in a magnificent fashion. The theme, contrary to expectation, is not fast (Rameau tells us so in his preface), but the variations build in momentum to a virtuoso conclusion. Running scales in both hands are then taken up by the middle voice in more complicated figurations. The fourth double reminds me of Variation 23 in Bach’s ‘Goldberg Variations’ which weren’t written for another fourteen years. The hands stab at each other, at first in single notes, but then in thirds and chords, often in the same register on the keyboard (made more difficult on the piano where there is only one, not two). The last two variations show off each hand in turn and demand great stamina and brilliance. While the left hand leaps with joy, the right displays the theme in all its glory. Septième d’une famille de onze enfants—dont quatre seulement passèrent le cap de la petite enfance—, Jean-Philippe Rameau naquit en 1683 à Dijon, d’un père organiste paroissial et d’une mère fille de notaire. Contrairement à Johann Sebastian Bach, de deux ans son cadet, et à François Couperin (né en 1668), il n’était pas issu d’une longue lignée de musiciens, son père étant le premier de la famille à avoir embrassé cette profession. Très tôt, avant même qu’ils sachent lire ou écrire, Rameau père enseigna la musique à ses enfants, ce qui explique peut-être pourquoi le jeune Jean-Philippe, entré au collège des jésuites, passait son temps à chanter ou à écrire de la musique, au lieu de suivre toutes les autres matières. Il abandonna d’ailleurs en cours de cycle, sans jamais avoir appris à parler ni à écrire avec élégance. Et ce fut seulement à dix-sept ans, lorsqu’une jeune femme dont il s’était épris lui reprocha son langage maladroit, qu’il se résolut à réviser sa grammaire française. Plus tard, il déclara que son amour de l’opéra était né quand il avait douze ans, à la suite, sans doute, des spectacles scolaires auxquels il avait participé. À dix-huit ans, il gagna l’Italie, mais y resta peu de temps, sans jamais dépasser Milan. Michel-Paul-Guy de Chabanon (1729/30–1792), qui publia ses souvenirs de rencontres avec lui, nous apprend combien il regretta, à la fin de sa vie, la brièveté de ce séjour car «il se serait perfectionné le goût». Revenu en France, il aurait passé quelques temps en Provence et en Languedoc, à tourner comme violoniste avec une troupe de théâtre. Mais la documentation concernant toute cette première moitié de sa vie est très sommaire, ce qui ne facilita pas la tâche de ses biographes. Pendant vingt ans, il alla d’église paroissiale en église paroissiale (Avignon, Clermont, Dijon, Lyon), sans jamais rester bien longtemps au même endroit et en partant généralement avant l’expiration de son contrat. En 1715, alors qu’il était à Clermont pour la seconde fois, il signa un contrat de vingt-neuf ans, qu’il parvint à honorer pendant seulement huit années. L’histoire veut que, les autorités municipales refusant de le laisser partir, il profitât de l’octave de Corpus Christi pour jouer des faux accords et choisir les pires combinaisons de registres, tant et si bien que l’on fut finalement content de se débarrasser de lui. À quarante ans, Rameau s’installa à Paris, où il demeura jusqu’à sa mort (il y avait travaillé brièvement pendant ses années d’itinérance). Deux ans plus tard, il épousa Marie-Louise Mangot, une cantatrice-claveciniste de dix-neuf ans qui chanta par la suite dans quelques-uns de ses opéras, à la cour. Ils eurent quatre enfants. D’un naturel secret, Rameau dévoila, semble-t-il, fort peu de choses sur son passé, même à son épouse. Jusqu’alors, Rameau avait surtout composé des cantates et des motets, ainsi qu’un premier livre de pièces de clavecin (1706). En 1722, il rédigea les quatre cent cinquante pages de son Traité de l’harmonie reduite à ses principes naturels, qui parut l’année suivante et lui valut une reconnaissance immédiate. Curieusement, il ne laissa aucune composition pour orgue, un instrument qui l’avait pourtant nourri durant trente-cinq ans (il fut organiste à Paris, à Sainte-Croix de la Bretonnerie, dans le Marais, de 1732 à 1738). Bien sûr, il dut sa célébrité à ses opéras, mais il lui fallut encore attendre dix ans avant d’écrire son premier chef-d’œuvre théâtral (Hippolyte et Aricie). Nommé Compositeur du Cabinet du Roi en 1745, il écrivit, de cinquante à soixante-dix ans, une vingtaine d’opéras et de ballets, et composa jusqu’à sa mort, peu avant ses quatre-vingt-un ans. Ses ouvrages théoriques et critiques furent nombreux. Il a peut-être commencé sur le tard, mais il a somptueusement rattrapé le temps perdu. Rameau avait un physique impressionnant: très grand, incroyablement mince, «il ressemblait plus à un fantôme qu’à un homme» (Chabanon). Le dramaturge Piron le dépeignait comme «un long tuyau d’orgue en l’absence du souffleur». À ses grands traits anguleux se mêlait un regard de braise, reflet de sa personnalité, comme l’avait déjà noté le père Gauthier au collège des jésuites—il le décrivait alors comme un enfant d’une rare vivacité. On l’accusa d’avarice (à sa mort, il avait un sac rempli de louis d’or, mais une seule paire de chaussures), alors qu’il fut, en réalité, très généreux envers les membres de sa famille et envers de nombreux jeunes musiciens. Chez lui, l’intellectualisme se mêlait à la passion et à la tendresse pour produire ce qu’il appelait lui-même «la vraie musique … le langage du cœur». Sa vivacité d’esprit transparaît três souvent dans ses Pièces de clavecin. Il en laissa une soixantaine au total, réparties en trois recueils, le premier de 1706, le deuxième de 1724 (révisé en 1731) et le dernier de 1729/30 environ. Sans oublier six pièces isolées, dont cinq sont des arrangements pour clavier solo d’œuvres tirées de ses Pièces de clavecin en concerts. J’ai choisi d’enregistrer ici trois des cinq suites figurant dans ces recueils, bien que Rameau lui-même ne leur donnât pas le titre de «Suite». Il regroupa juste les pièces de même tonalité (majeur et mineur), comme il était alors de coutume. La première édition moderne des œuvres pour clavier de Rameau parut en France en 1795, préparée par Camille Saint-Saëns. Cette édition est désormais republiée chez Dover. À cette époque-là, cependant, le clavecin n’était guère, voire pas, utilisé comme instrument solo et la plupart des ornements étant jugés impossibles et inappropriés au piano, ils furent tout bonnement supprimés. Heureusement, l’édition Bärenreiter restaure le texte original et contient, en outre, les inestimables introductions rédigées par Rameau pour ses deuxième et troisième recueils. Quiconque entreprend de jouer d’un instrument à clavier devrait lire son essai intitulé De la Mechanique des Doigts sur le Clavessin (pas de mouvements inutiles, s’il vous plaît!). La table des ornements est, elle aussi, cruciale pour exécuter correctement ces pièces. La Suite en mi mineur (1724, révisée en 1731) est sans cesse merveilleuse et l’on s’étonne qu’elle ne soit pas jouée plus souvent dans son intégralité. Elle contient le fameux Tambourin (probablement l’air le plus célèbre de Rameau) et s’ouvre sur une Allemande qui possède un rythme charmant, tout en préservant la noblesse de cette danse. Cette noblesse se répercute dans la Courante, authentique exemple du modèle français mariant élégance majestueuse avec sophistication et précision rythmiques. Vient ensuite une série de mouvements qui comptent parmi les plus immédiatement séduisants de Rameau avec, pour commencer, deux Gigues en rondeau. Danse originaire d’Écosse ou d’Irlande, la gigue était peut-être liée aux marins (il en reste quelque chose dans la seconde) mais, ici, Rameau mélange les modèles italien (notes égales, liées) et français (la forme rondeau et la profusion d’ornements). Le morceau suivant, l’étonnant Le rappel des oiseaux, est la première pièce de «genre» des Suites de Rameau. Ses appels martiaux, toujours plus insistants, poussent les oiseaux à agir. Nous retrouvons ensuite la danse avec deux Rigaudons, le second, en majeur (avec un double, i.e. une variation), accusant tout particulièrement le caractère enjoué et souple de cette danse. Le rigaudon, qui se dansait en cercle, figure souvent dans les opéras de Rameau. La Musette en rondeau est une tendre scène pastorale que le compositeur recycla dans son opéra-ballet Les fêtes d’Hébé (1739). L’insistant bourdon de cornemuse et les trilles des oiseaux accompagnent le contentement des vendanges. Dans la version orchestrale, l’«inégalité» des croches est écrite en toutes notes, attestant la pratique du jeu inégal, sans lequel la musique baroque française sonne tout simplement faux. Comme dans Les fêtes d’Hébé, la Musette est suivie du fameux Tambourin—une danse théâtrale dans laquelle le danseur tenait un tambourin et qui devint l’une des plus populaires du règne de Louis XV. Assez étrangement, mais fort efficacement, Rameau décide de ne pas en rester là et prologne sa Suite avec La villageoise, un rondeau poignant, innocent, dont il embellit finalement le thème par une extension du second couplet. Les deux dernières suites de ce disque représentent l’intégralité des Nouvelles suites de pièces de clavecin de Rameau parues vers 1729/30. D’une richesse incroyable, elles regorgent de passion, de sens du drame, mais aussi de nouveaux effets techniques au clavier. Il vaut de souligner que, lorsqu’elles parurent, Couperin avait écrit trois de ses quatre livres de pièces de clavecin, Bach avait édité la moitié de ses six partitas (une par an à compter de 1726) et Haendel avait achevé son premier corpus de suites pour clavier, tandis que Scarlatti n’avait pas encore entrepris d’écrire ses sonates. La Suite en sol mineur s’ouvre sur une série de pièces plutôt innocentes. Les tricotets, fort populaires aux XVIe et XVIIe siècles, étaient parmi les danses préférées d’Henri IV. Probablement les mouvements rapides des pieds, avec les talons et les pointes, entendaient-ils simuler l’agilité des tricoteuses. L’alternance de deux et trois temps par mesure nous rappelle d’emblée le menuet de la Partita no 5 de Bach, également en sol majeur. L’indifferente est un menuet; ce titre, qu’on donnait alors très souvent aux pièces de caractère, est aussi celui d’un tableau de Watteau, peint onze ans plus tôt. S’ensuivent deux gracieux Menuets, l’un en majeur, l’autre en mineur, le premier réapparaissant neuf ans plus tard, dans la tragédie lyrique Castor et Pollux. Vient ensuite l’un des chefs-d’œuvre de Rameau, La poule, et son obsédant gloussement (le compositeur écrit «co co co co co coco dai» sous les notes d’ouverture). Ce pur drame a, pour citer Cuthbert Girdlestone qui consacra une biographie à Rameau en 1957, «l’intensité et la résolution d’une tragédie de Racine, avec des alternances entre espoir et désespoir»—des contrastes que le compositeur marque par les mots «fort» et «doux». Peut-être les linéaments de cette pièce remontent-ils au début de la période parisienne de Rameau, quand le père jésuite Castel, évoquant avec lui les chants d’oiseaux notés dans les écrits d’Athanasius Kircher (1650), éveilla son goût pour dépeindre la nature. Les cinq notes répétées du thème deviennent, vers la fin, des accords martelés à la main droite, avec les arpèges transférés à la basse. Respecter toute l’ornementation de Rameau nécessite un travail rapide des doigts. Le mouvement suivant, Les triolets, nous apaise par sa mélancolie poétique et par sa tendresse. Dans sa préface, Rameau spécifie qu’il faut le jouer sans hâte. Il s’achève sur une «petite reprise»—un écho, écrit en toutes notes, des dernières mesures. Le triolet était une forme poétique médiévale qui redevint populaire au XVIIe siècle. Le 10 septembre 1725, Rameau vit deux Indiens de la Louisiane se produire à l’un des théàtres de la Foire. Leurs danses durent l’impressionner car il les transposa dans la pièce suivante, Les sauvages. En tant que Canadienne, je ne peux m’empêcher d’imaginer les exhibitions colorées de nos Amérindiens, surtout lorsque je joue les notes répétées descendantes du thème. Cette pièce devint l’une des plus populaires de Rameau, qui l’inséra plus tard dans son opéra-ballet Les Indes galantes. L’atmosphère est celle d’une lamentation, avec des chromatismes poignants et quelques mesures contrastées où, pour alterner avec «gracieusement», Rameau écrit «hardiment, sans altérer la mesure». Inspiré par la danse d’une bohémienne, le mouvement final, L’egiptienne, clôt brillamment cette Suite. Dans sa préface, Rameau nous avertit judicieusement de ne pas jouer trop vite les pièces rapides, mais de nous attacher plutôt à appréhender leur juste caractère. Ce qui nous semble valoir tout particulièrement pour cette pièce. Dans la Suite en la mineur, Rameau recourt aux traditionnelles danses d’ouverture que sont l’Allemande, la Courante et la Sarabande, mais en leur appliquant un traitement bien à lui. D’emblée, il instaure une grandeur noble, que seules quelques mesures d’une figure de type toccata viennent brièvement dissiper à la fin de chaque section de l’Allemande. L’écriture est bien plus contrapuntique que dans la Suite en mi mineur précédente, et son interprétation constitue un bien plus grand défi. Girdlestone a, selon moi, raison de s’attacher autant à la Courante—à ses yeux, «l’un des summums de l’art de Rameau». C’est l’une des pièces les plus difficiles à comprendre et à jouer, non seulement à cause de son riche contrepoint et de ses complexités rythmiques (il faut user judicieusement du jeu inégal, librement mais dans un cadre strict), mais parce que l’exécution des ornements requiert également une immense maîtrise. Même une fois que l’on est parvenu à comprendre, il faut encore faire la musique. Pour reprendre Girdlestone: «Il faut frapper plus d’une fois à la porte avant qu’elle ne s’ouvre, mais les richesses qu’elle cache sont indubitables et le jeu en vaut la chandelle.» La solennelle Sarabande est, elle aussi, richement ornementée, avec des arpèges tournoyants, écrits en toutes notes, qui exacerbent la tension. Rameau s’en reservit plus de vingt ans plus tard dans sa tragédie lyrique Zoroastre. Dans la pièce suivant, intitulée Les trois mains, Rameau crée l’illusion de trois mains en faisant constamment passer la main gauche par-dessus la main droite, dotant d’abord la tendre mélodie d’un accompagnement croisé; puis la musique se fait plus guillerette, annonçant Scarlatti. Viennent ensuite deux pièces de caractère contrastées: la première, Fanfarinette (un surnom féminin), devait faire allusion à une personne douée d’un grand charme—insouciante et flirteuse. La seconde, La triomphante, fait honneur à son titre. Cette Suite se clôt avec magnificence sur la Gavotte et ses six variations. Le thème n’est pas rapide, contrairement au tempo de gavotte habituel (Rameau nous le dit bien dans sa préface), mais les variations gagnent en élan jusqu’à une conclusion virtuose. Puis, les gammes précipitées aux deux mains sont reprises par la voix médiane dans des figurations plus complexes. Le quatrième double me rappelle la vingt-troisième des «Variations Goldberg» de Bach, postérieure de quatorze ans. Les mains s’éperonnent, d’abord en notes isolées, puis en tierces et en accords, souvent dans le même registre au clavier (ce qui est plus difficile au piano, où l’on en n’a qu’un, et non deux). Les deux dernières variations exposent chaque main tour à tour, exigeant beaucoup d’endurance et de brio. Pendant que la main gauche saute de joie, la droite exhibe le thème dans toute sa gloire. Jean-Philippe Rameau wurde 1683 in Dijon als Sohn eines örtlichen Organisten und der Tochter eines Notars geboren. Er war das siebte von elf Kindern, von denen nur vier das Kindesalter überlebten. Anders als der zwei Jahre jüngere Johann Sebastian Bach und der 1668 geborene François Couperin stammte Rameau nicht aus einer langen Reihe von Komponisten—sein Vater war der erste in der Familie, der diesen Beruf wählte. Rameau père unterrichtete seine Kinder in der Musik bevor sie lesen oder schreiben lernten, und das war wohl der Grund, warum der junge Jean-Philippe im Jesuitenkolleg, wo er studierte, immer sang und Musik schrieb, statt sich mit seinen andern Fächern zu befassen. Er verließ die Schule ohne Abschluß und ohne gelernt zu haben, elegant zu sprechen oder schreiben. Erst als eine junge Dame, in die er sich mit siebzehn verliebt hatte, ihn wegen seiner unbeholfenen Sprache tadelte, entschied er sich, seine französische Grammatik aufzupolieren. Rameau äußerte später einmal, dass seine Liebe zur Oper im Alter von zwölf Jahren—zweifellos von den Schulinszenierungen angeregt—begann. Als er achtzehn war, ging er nach Italien, hielt sich dort aber nur kurze Zeit auf und schaffte es nie weiter als nach Mailand. Michel-Paul-Guy de Chabanon (1729/30–1792), der Memoiren seiner Begegnungen mit dem Komponisten veröffentlichte, teilt uns mit, dass Rameau in seinem späteren Leben bedauerte, nicht länger geblieben zu sein, da es „seinen Geschmack verfeinert“ hätte. Als er nach Frankreich zurückkehrte, verbrachte er wahrscheinlich einige Zeit als Geiger mit einer Theaterwandertruppe in der Provence und dem Languedoc. Die Dokumentation der ersten Lebenshälfte Rameaus ist äußerst lückenhaft, was seinen Biographen das Leben schwer macht. In den nächsten zwanzig Jahren zog er von einer provinziellen Kirche zur nächsten (Avignon, Clermont, Dijon, Lyon), blieb aber nie lange in einer Stelle und kündigte meist schon bevor sein Vertrag ablief. Als er 1715 zum zweiten Mal in Clermont war, unterzeichnete er einen Vertrag für 29 Jahre, hielt es aber nur acht aus. Als die Behörden ihm nicht erlaubten zu gehen, soll er angeblich in der Fronleichnams-Oktav absichtlich nur Dissonanzen gespielt und die schlimmsten Registerkombinationen ausgewählt haben, so dass sie ihn schließlich gerne los wurden. Im Alter von vierzig Jahren ging Rameau nach Paris, wo er den Rest seines Lebens verbrachte (er hatte hier schon während seiner Wanderjahre kurz gearbeitet). Zwei Jahre später heiratete er die neunzehnjährige Marie-Louise Mangot, eine Sängerin und Cembalistin, die später in einigen Aufführungen seiner Opern am Hof singen sollte. Sie hatten vier Kinder. Von Natur aus verschlossen, enthüllte er selbst ihr nur wenig aus seinem früheren Leben. Rameaus Kompositionen bis zu diesem Zeitpunkt waren meist Kantaten und Motetten sowie ein erstes Buch von Cembalostücken (1706). 1722 schrieb er sein 450 Seiten umfassendes Traité de l’harmonie reduite à ses principes naturels, was ihm nach seiner Veröffentlichung im folgenden Jahr unmittelbares Ansehen verschaffte. Es ist seltsam, dass er keine Kompositionen für Orgel hinterließ, da ihm dieses Instrument 35 Jahre seinen Lebensunterhalt verdiente (von 1732 bis 1738 war er Organist an der Sainte-Croix de la Bretonnerie im Pariser Marais-Distrikt). Sein Ruhm folgte natürlich später als Opernkomponist, obwohl es noch weitere zehn Jahre dauern sollte, bevor er sein erstes Meisterwerk fürs Theater (Hippolyte et Aricie) schreiben sollte. 1745 wurde er zum Compositeur du Cabinet du Roi ernannt, komponierte von seinem 50. bis 70. Lebensjahr etwa 20 Opern und Ballette und schrieb noch bis zu seinem Tode kurz vor seinem 81. Geburtstag weiter. Seine theoretischen und kritischen Schriften waren umfangreich. Rameau mag wohl ein Spätzünder gewesen sein, aber er holte im Übermaß auf. Seine physische Erscheinung war bemerkenswert: baumlang und unglaublich dünn, „eher einem Gespenst als einem Manne ähnlich“ (Chabanon). Der Dramatiker Piron beschrieb ihn als „eine lange Orgelpfeife ohne Gebläse“. Seine markanten, scharfen Gesichtszüge und feurigen Augen reflektierten seine Persönlichkeit, die schon Vater Gauthier am Jesuitenkolleg bemerkte, der ihn als ungewöhnlich lebhaftes Kind beschrieb. Man warf ihm Geiz vor, und als er starb, besaß er zwar einen Sack voll Louis d’or, doch nur ein Paar Schuhe, aber er war großzügig zu seiner Familie und half vielen jungen Musikern. In Rameau vereinten sich Intellektualismus mit Leidenschaft und und Empfindsamkeit um, in seinen eigenen Worten, „wahre Musik … die Sprache des Herzens“ zu schaffen. Diese Lebhaftigkeit des Geistes manifestiert sich in großer Fülle in seinen Pièces de clavecin. Insgesamt hinterließ er etwa sechzig Stücke: nach der ersten Sammlung von 1706 folgte ein zweites Heft, das 1724 veröffentlicht (und 1731 revidiert) wurde und circa 1729–30 ein drittes. Zusätzlich gibt es sechs Einzelstücke, von denen fünf Solobearbeitungen von Werken aus seinen Pièces de clavecin en concerts sind. Für die vorliegende Aufnahme wählte ich drei der fünf in diesen Sammlungen enthalten Suiten aus, obwohl Rameau selbst ihnen nicht den Titel „Suite“ gab. Er stellte einfach, wie damals üblich, mehrere Stücke in der gleichen Tonart (Dur und Moll) zusammen. Die erste moderne Ausgabe von Rameaus Werken für Tasteninstrumente wurde 1895 in Frankreich veröffentlicht, herausgegeben von Camille Saint-Saëns. Diese Ausgabe ist heute in einem Nachdruck von Dover erhältlich. Man muss sich jedoch bewusst sein, dass zu dieser Zeit das Cembalo, wenn überhaupt, nur selten als Soloinstrument in Gebrauch war und die meisten Verzierungen auf dem modernen Klavier als unmöglich und unangebracht betrachtet wurden. Daher wurden sie einfach ausgelassen. Die Bärenreiter-Ausgabe stellt glücklicherweise wieder den Originaltext zur Verfügung. Sie enthält auch die außerordentlich wertvollen Einleitungen, die Rameau für die zweite und dritte Sammlung schrieb. Sein Essay Über die Fingertechnik beim Cembalospiel sollte von allen gelesen werden, die versuchen, ein Tasteninstrument zu spielen (bitte keine überflüssigen Bewegungen!). Die Verzierungstabelle ist für die angemessene Ausführung dieser Stücke ebenfalls unentbehrlich. Die Suite in e-Moll (1724, revidiert 1731) ist von Anfang bis Ende ein wunderbares Stück, und es überrascht, dass sie nicht öfter komplett zu hören ist. Sie enthält das wohl bekannte Tambourin, womöglich Rameaus berühmtestes Stück. Die Suite beginnt mit einer Allemande, die herrlichen Schwung besitzt, ohne die Stattlichkeit des Tanzes zu verlieren. Diese wird in der Courante beibehalten, die ein echtes Beispiel des französischen Typs ist und erhabene Eleganz mit rhythmischer Komplexität und Präzision verbindet. Dann folgt eine Reihe von Sätzen, die zu den unmittelbar attraktivsten Rameaus gehören; zunächst zwei Gigues en rondeau. Der Originaltanz stammte aus Schottland oder Irland, wo er als Matrosentanz begonnen haben könnte (ein Anklang daran findet sich in der zweiten Gigue), aber Rameau bietet uns eine Mischung zwischen italienischem (gleichmäßige Noten, Legato) und französischem Typ (die Rondeau-Form und reichhaltige Ornamentation). Das nächste Stück, das atemberaubende Le rappel des oiseaux, ist das erste „Genre“-Stück in seinen Suiten. Die kriegerischen Signalrufe werden im Verlauf des Stückes nach und nach eindringlicher. Dann kehren wir mit zwei Rigaudons zum Tanz zurück, deren zweiter in Dur (mit einem Double oder Variation) den lebhaften, federnden Charakter besonders betont. Es war ein Reigentanz, der oft in seinen Opern erscheint, Die Musette en rondeau ist eine zarte pastorale Szene, die Rameau in seinem Opernballett Les fêtes d’Hébé (1739) wieder verwendet. Der beständige Bordun eines Dudelsacks und Vogelgezwitscher begleiten das Wohlbefinden während des Weinherbstes. In der Orchesterfassung wird die „Inégalité“ (Ungleichmäßigkeit) der Achtel ausgeschrieben, was die Praxis des Jeu inégal bestätigt, ohne das französische Barockmusik einfach falsch klingt. Wie in Les fêtes d’Hébé folgt der Musette das berühmte Tambourin—während der Regierungszeit von Ludwig XV. War es einer der populärsten Tänze im Theater, in dem der Tänzer ein Tamburin in der Hand hielt. Seltsamerweise, aber wirkungsvoll, entschied Rameau, seine Suite nicht hier zu beenden, sondern mit La villageoise, einem rührend naiven Rondeau, dessen Thema er als Erweiterung des zweiten Couplets ausziert. Die anderen beiden Suiten auf dieser CD repräsentieren Rameaus komplette Nouvelles suites de pièces de clavecin, die um 1729–30 erschienen. In ihnen finden wir größere Reichhaltigkeit, Leidenschaft und Gespür für Drama sowie einige neue technische Tasteneffekte. Es ist interessant, zu bedenken, dass zur Zeit ihrer Publikation Couperin drei seiner vier Hefte von Cembalostücken geschrieben hatte, Bach dabei war, seine sechs Partiten zu veröffentlichen (eine pro Jahr ab 1726), Händel seine erste Sammlung von Cembalo-Suiten geschrieben hatte, aber Scarlatti noch nicht mit der Komposition seiner Sonaten begonnen hatte. Die ersten paar Stücke in der Suite in g-Moll sind arglos genug. Les tricotets war ein populärer Tanz im 16. und 17. Jahrhundert und einer der Lieblingstänze von Heinrich IV. Die schnelle Bewegung von Versen und Zehenspitzen soll wohl die Geschicklichkeit der Stricker darstellen („tricoter“ bedeutet „stricken“). Die Abwechslung von zwei und drei Schlägen pro Takt erinnert an das Menuett in Bachs Fünfter Partita—ebenfalls in G-Dur. L’indifferente („Die gleichgültige Geliebte“) ist ein Menuett und war ein beliebter Titel für ein Charakterstück (wie auch für ein Bild von Watteau, das er etwa elf Jahre vor der Komposition dieses Stückes malte). Das erste der beiden graziösen Menuette, die folgen, eines in Dur, das andere in Moll, taucht neun Jahre später in Rameaus lyrischer Tragödie Castor et Pollux wieder auf. Dann folgt eines von Rameaus Meisterstücken, La poule, mit dem unablässigen Glucken der Henne (Rameau schreibt „co co co co co coco dai“ unter die Anfangsnoten). Es ist schieres Drama, und „besitzt die Intensität und eiserne Konsequenz einer Tragödie von Racine, mit abwechselnder Hoffnung und Verzweifung“, wie Cuthbert Girdlestone 1957 in seiner Biographie des Komponisten schreibt. Rameau markiert diese Kontraste mit den Worten fort und doux. Die ersten Skizzen für dieses Stück gehen womöglich bis zu seinen frühen Tagen in Paris zurück, als der Jesuitenpater Castel die Vogelgesänge in den Schriften von Athanasius Kircher (1650) diskutierte und Rameaus Gespür für Naturschilderung wachrief. Die fünf wiederholten Noten des Themas verwandeln sich gegen Ende des Stückes in gehämmerte Akkorde in der rechten Hand, während die Arpeggien in den Bass übertragen werden. Alle Verzierungen Rameaus zu beachten erfordert behende Finger. Der nächste Satz der Suite, Les triolets, beruhigt uns mit seiner poetischen Melancholie und Zärtlickeit. Rameau schreibt im Vorwort zu seiner Sammlung, dass er nicht schnell genommen werden sollte. Er endet mit einer „petite reprise“—einem ausgeschriebenen Echo der letzten paar Takte. Ein Triolet war eine mittelalterliche Gedichtform, die im 17. Jahhundert wieder populär wurde. Am 10. September 1725 besuchte Rameau eine Aufführung von zwei Indianern aus Louisiana in einem Theater auf einem Jahrmarkt. Ihr Tanzen muss ihn beeindruckt haben, denn er charakterisierte sie in seinem nächsten Stück Les sauvages. Als Kanadierin kann ich nicht anders, als mir die bunten Darstellungen unserer kanadischen Ureinwohner vorzustellen, besonders, wenn ich die absteigenden wiederholten Noten des Themas spiele. Es sollte eines der beliebtesten Werke Rameaus werden, das er später in sein Opernballett Les Indes galantes aufnahm. Die Stimmung ist die eines Laments mit wehmütiger Chromatik und einigen Takten, die Rameau im Kontrast zu gracieusement („graziös“) mit hardiment, sans altérer la mesure („keck, ohne Änderung des Tempos“) überschreibt. Der letzte Satz, L’egiptienne, wurde durch das Tanzen eines Zigeunermädchens inspiriert und bringt die Suite zu ihrem brillanten Abschluss. Im Vorwort warnt Rameau, die schnellen Stücke nicht zu schnell zu nehmen, sondern sich stattdessen darauf zu konzentrieren, ihren Charakter richtig zu erfassen. Das scheint für dieses Stück besonders angebracht. Für die Suite in a-Moll verwendet Rameau die traditionellen Anfangssätze von Allemande, Courante, Sarabande, aber in seiner Behandlung findet sich nichts gewöhnliches. Von Anfang an schlägt er einen Ton nobler Würde an, der nur am Ende jedes Abschnitts der Allemande, kurz erleichtert wird, wo er für ein paar Takte eine tokkatenhafte Figur einführt. Die Schreibweise ist kontrapunktischer als in der früheren e-Moll-Suite, die Interpretation herausfordernder. Ich glaube, Girdlestone hat Recht, wenn er der Courante, die er als „einen der Gipfelpunkte in Rameaus Kunst“ beschreibt, soviel Aufmerksamkeit schenkt. Sie ist sowohl vom Verständnis als auch vom Spiel her eines seiner schwierigsten Stücke, nicht nur wegen ihres üppigen Kontrapunkts und ryhthmischer Komplexität (jeu inégal muss geschickt und frei, aber innerhalb eines strengen Rahmens eingesetzt werden), sondern auch, weil die Ausführung der Verzierungen enormes Geschick erfordert. Und nachdem man all dies bewältigt hat, muss man noch Musik machen. Wie Girdlestone sagt: „Man muss mehrmals an die Tür klopfen, bis sie sich öffnet, aber die Reichtümer, die sich dahinter verbergen, stehen außer Zweifel und die Mühe lohnt sich.“ Die feierliche Sarabande mit ihren wirbelnden, ausgeschriebenen Arpeggien, die die Spannung anziehen, ist ebenfalls reich verziert. Sie wurde über zwanzig Jahre später in seiner lyrischen Tragödie Zoroastre wieder verwendet. Im nächsten Stück, Les trois mains, erweckt Rameau den Eindruck, dass drei Hände spielen, indem er die linke stets über die rechte Hand übergreifen läßt—am Anfang schreibt er eine überkreuzte-Begleitung zu der zarten Melodie, später wird die Musik lebhafter und gibt ein Vorecho auf Scarlatti. Danach folgen zwei Charakterstücke: das erste, Fanfarinette (ein weiblicher Kosename) muss jemand von großen Scharme beschrieben haben—unbekümmert und kokett. Das zweite, La triomphante, ist genau das. Die abschließende Gavotte mit ihren sechs Variationen beendet die Suite in herrlicher Manier. Anders als das übliche Gavottentempo ist das Thema nicht schnell (so teilt uns Rameau im Vorwort mit), aber die Variationen entwickeln bis zum virtuosen Abschluss mehr und mehr Dynamik. Skalenläufe in beiden Händen werden dann von der Mittelstimme in komplizierteren Figurationen übernommen. Das vierte Double erinnert mich an Variation 23 in Bachs Goldberg-Variationen, die erst vierzehn Jahre später geschrieben werden sollten. Die beiden Hände stechen aufeinander ein, zunächst mit Einzelnoten, dann in Terzen und Akkorden (auf dem nur einmanualigen Klavier wesentlich schwieriger). Die letzten beiden Variationen stellen jede Hand einzeln zur Schau und erfordern großes Durchhaltevermögen und Brillanz. Während die linke Hand Freudensprünge macht, lässt die rechte das Thema in seiner ganzen Glorie ertönen.